Hot Water Recirculation Systems -- how much energy waste? I wanted pass on our experience with our hot water recirculation system, and some measurements on how much energy it wastes. The bottom line is that the recirculation system we inherited when we bought our current house has cost us about $3,200 in wasted propane use over the 8 years we have had the house! If you have or are thinking about a recirculation system, I'd read carefully through all the material below -- some of these systems are very very wasteful. These systems are designed to let you get hot water instantly even at faucets distant from the hot water tank, but they can be VERY wasteful if not very carefully designed and implemented. Homes with long plumbing runs from the the hot water tank to the places where the water is used can have a long wait for hot water. You turn the hot water tap on, and a minute later its still running cold. This wastes both water and energy, and is an inconvenience. To overcome this problem, a water recirculation system can be added. These systems overcome the problem by keeping the water in the hot water supply pipe hot, so that when you turn the tap on, you get instant hot water. There are several kinds of systems. One type runs an extra water pipe out to the farthest water using fixture you have. This extra pipe pipe allows water to be circulated from the hot water tank, out through the hot water supply pipe, and then back the extra pipe to the water heater. In this way the water in the supply pipe is always hot. Another type installs a crossover between the hot and cold supply lines at the farthest water using device. The crossover and related components allow water from the hot water tank to be circulated out to the crossover, and then back thru the cold water line to the hot water tank. The result is the same -- instant hot water. 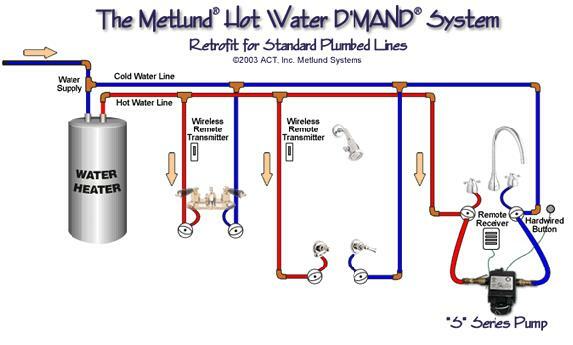 This system is easier for retrofits, since you don't need to add any pipe. for circulation -- from the Metlund site. Most of these systems use a pump to circulate water, but passive circulation is also possible. They can be on a timer so that the pump is only running when people might want hot water. They can be run on a thermostat that only runs the pump when the water temperature in the pipe cools below a certain point. They can be set up to only run the pump when the person who wants water "requests" it. The "request" can be pushing a button to indicate you are going to use hot water soon, or it can be a motion sensor that turns the pump on when people are in the bathroom. Electricity used to run the pump. For a modest sized pump, this might be 400 to 800 KWH a year if the pump runs all the time. Heat loss from the pipe. Whenever the two pipes are hot, they will be losing heat. This heat comes from the hot water tank, and the water heater must use more fuel to provide the heat. The heat loss is significant even if the pipes are insulated. During the winter, this heat may help to heat your house. Or, it may not, depending on how the pipe is routed. This added heat may be a benefit in the winter, but it will also add heat to your house in the summer, which will just make it hotter, and may result in higher AC bills. The systems vary in how much energy is wasted. The ones that run a pump 24/7 obviously waste more heat and electricity. The ones that work off a timer or thermostat would save some of this waste, but not nearly all of it. The "demand" systems would be much more efficient, since they only circulate water when its actually needed. I estimated the energy waste for recirculation by measuring the amount of energy my gas water heater uses with and without the recirculation loop enabled. With the recirculation system on, the gas burner comes on every 1.25 hours for 5.1 minutes. With the recirculation system off, the burner comes on every 5 hours for 5.1 minutes. All of these measurements were taken over the night period when no hot water was being used. If you go through the math on this (see below), it comes out to 200 gallons of extra propane wasted per year to support the recirculation system. For the 8 years we have been in this house, and using the current price of propane, this is $3,200 worth of wasted propane. Not to mention the 21,000 lbs of CO2 emissions. Note that in our case the recirculation loop has no pump at all -- the water just thermosyphons through the loop. The loop originally had a pump that ran 24/7, which I removed when we moved in. Had I left the pump in, and running 24/7, the electricity consumption would have been 745 KWH per year. For the 8 years we have been here, this is nearly 6,000 KWH worth $600 at our electric rates. In addition, 12,000 lbs of CO2 would have emitted. If you are doing a new house, try and avoid any need for recirculation systems at all. Try to locate the hot water using fixtures as close to the hot water heater as possible. Using a "Home Run" plumbing system will also help greatly to minimize the wait for hot water and the waste of water. If you are going to use a recirculation system, use an efficient one. The demand style systems will waste far less energy than the other types of systems. The demand systems may cost a bit more, and may be a little less convenient to use, but the saving in energy and greenhouse gas emissions are well worth it. While these systems still lose all the energy used to heat the water left in the supply pipe after using hot water, they at least don't keep reheating the water in the pipes constantly, and they don't constantly waste electricity to run the circulation pump. Even if you don't use a recirculation system, or use the more efficient on demand system, you will still waste the energy that went into heating the water in the line out to the far fixture every time you use hot water. This water just gets left in the pipe and cools down to house or crawl space temperature. In our case, this is about 2 gallons of water. Heating this 2 gallons of water costs about (2 gal)(8.3 lb/gal)(120F - 50F)(1 BTU/lb-F) = 1170 BTU. If you do this 4 times a day, it amounts to 1.7 million BTU/year, or 18 gallons of propane a year. The only way to avoid this energy waste is to locate the hot water tank near the fixtures, and use the Home Run system mentioned to minimize the water volume in the pipes. We are still trying to figure out the best way to fix this problem at our house. We are considering the on demand circulation system, or adding a separate tankless water heater to serve the distant bathroom. Since this is our main use bathroom, we are leaning toward adding the new tankless heater to serve this area. We decided to solve the problems of energy waste caused by the recirculation system by installing a Takagi tankless water heater in the crawl space under the far bedroom. This tankless supplies only the far bathroom, which is our main area for using hot water. It probably accounts for around 80% of our hot water use. It runs on propane, and has an energy factor of 0.85, and no standby losses or water recirculation losses. This also works out well in that it allows a straight forward way to connect the solar water heater that we are adding. The installation was fairly time consuming in that it required running a new gas line to that area, rearranging and adding some plumbing, installing the through wall exhaust vent system, and adding a new outlet in that area. This took the equivalent of two full days of my amateur labor. Most installations would be much more straight forward. So far, we really like the tankless heater. It supplies hot water quickly and endlessly and without waste of energy, and its very quiet. It is amazingly compact. The new Takagi tankless installed. Update April, 2009: We have added a solar water heating system to preheat the water coming to this tankless heater. The solar water heater is actually satisfying nearly all of our hot water demand. Had I known that the solar water heating system was going to do so well, I probably would have put a simple electric tank heater in with lots of insulation. While I don't like heating water with electricity due to the high CO2 emissions from our electric grid (3X those for propane or NG), with the solar heater providing nearly all our hot water, the electricity use would have been small. In an email comment, Ron points out that I do not give credit to the recirculation systems for the water they save. This is a good point. Even the most energy inefficient recirculation systems save some water on every hot water use. The amount will vary with the length of your plumbing runs, but in our case, its as much as 2 gallons for each use. In our case this might add up to nearly 5000 gallons per year. The impact of this extra water use would vary depending on where you live and what the water situation is there. In some areas, the impact of this extra water use may be small, but in others it could certainly be significant. I suppose this puts even more emphasis on designing systems from the start that are efficient both in water use and in energy use. As discussed above, this means placing the hot water source and hot water use points to minimize water in the lines, and using minimum diameter plumbing runs (e.g. the Home Run systems). If you are stuck with long plumbing runs and long hot water waits, then using the most efficient of the recirculation systems, or adding a hot water source near the distant point of use are the options that save both energy and water. These are the details on how I measured the energy wasted by the recirculation system on our house. Our house uses the type of system in which an extra pipe is added allow water to be circulated out the hot water supply pipe, and then back to the tank using the extra pipe. The supply pipe is 3/4 inch copper, and the extra return pipe is half inch copper. The runs about 60 ft long. All of the lines are insulated. While the system initially had a Grundfos UPS 15-42 circulation pump, I removed the pump, so the water circulates only by thermosyphoning through the pipe. Before I took the pump out, it used 85 watts 24/7, or about 745 KWH/year! The tank temperature is set to about 120F. About half of the pipe run is through the ceiling of a finished basement, and the rest is through a crawl space. The hot water tank is a Rheem power vent tank. Whenever the tank needs to run the burner to maintain temperature, the burner turns on, and an electric blower turns on to exhaust combustion products. The blower motor and the burner are on for the same amount of time. With the recirculation loop on: burner on time was 5.1 minutes every 1.25 hours. With the recirculation loop off: burner on time was 5.1 minutes every 5 hours. 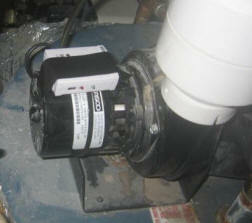 The water heater burner input rate is 40,000 BTU/hr. So, the burner runs 452 hours more per year with the circulation loop on (598 hr - 146 hr = 452 hr). Propane has a heating content of 92,000 BTU/gallon, so, the 18 MBTU equates to 197 gallons of extra propane per year. In our area, this is $394 worth of propane per year. Over the 8 years we have been in this house, this is $3150 worth of propane! These are the logger plots showing the burner on times over two nights -- the first plot has the circulation loop on, and the 2nd has the circulation loop off. I have done this on several nights with the same result. Burner on times with the recirculation loop in use. Approximately 5.1 minutes every 1.25 hours. Burner on time with the recirculation system turned off. Burner on time approximately 5.1 minutes every 5 hours.